The trouble with chicken satay skewers is knowing when to stop indulging. Try these tasty treats as a party snack finger food, or as a quick mid-week meal where they’re best served with a crunchy cucumber salad and steamed rice to soak up all that wonderful satay sauce. The gentle flavour of the sweet coconut chicken combined with the nutty, salty tang of the satay sauce lends itself perfectly to a medium bodied white to accompany it, but one with a little bit of residual sugar itself. Try a Riesling or a Chardonnay – but beer works equally well. Try a crisp, light lager or even a pilsner. 1. Combine coconut milk, sugar, 2 tbs soy sauce, curry powder and turmeric in a large glass or ceramic dish. Add chicken. Turn to coat. Cover and place in the fridge for 3 hours or overnight to marinate. 2. Drain the chicken, reserving the marinade. Thread onto bamboo skewers. Transfer the reserved marinade to a saucepan. Add peanut butter and 1 tbs light soy sauce. Bring to the boil over high heat. Reduce heat to medium. Cook, stirring often, for 5 minutes or until the sauce thickens. Stir in lime juice. 3. Preheat a chargrill or barbecue grill on high. 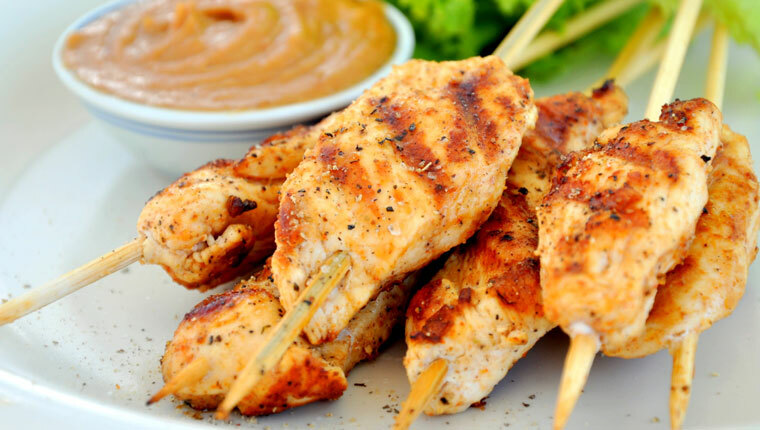 Cook the chicken skewers for 2-3 minutes each side or until cooked through. Divide among serving plates and set aside the satay dipping sauce. 4. Soak 12 bamboo skewers in cold water for 20 minutes for this recipe.